Mobile Developer is basically involved in satisfying the client’s needs by developing and maintaining high-quality software for mobile devices. 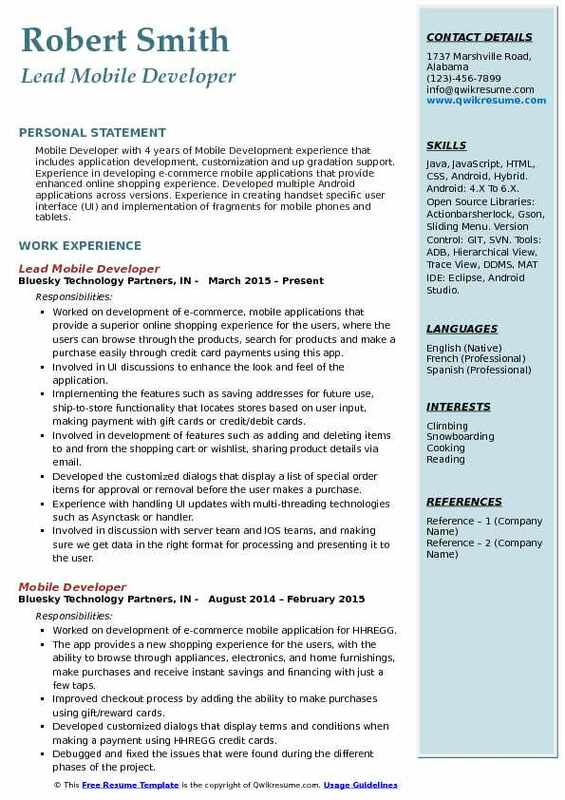 The job description for the mobile developer’s resume includes the following – discussing client’s needs and specifications, designing the appropriate application, writing source code, solving technical issues, assessing program effectiveness, collaborating with internal department and making changes based on client request. 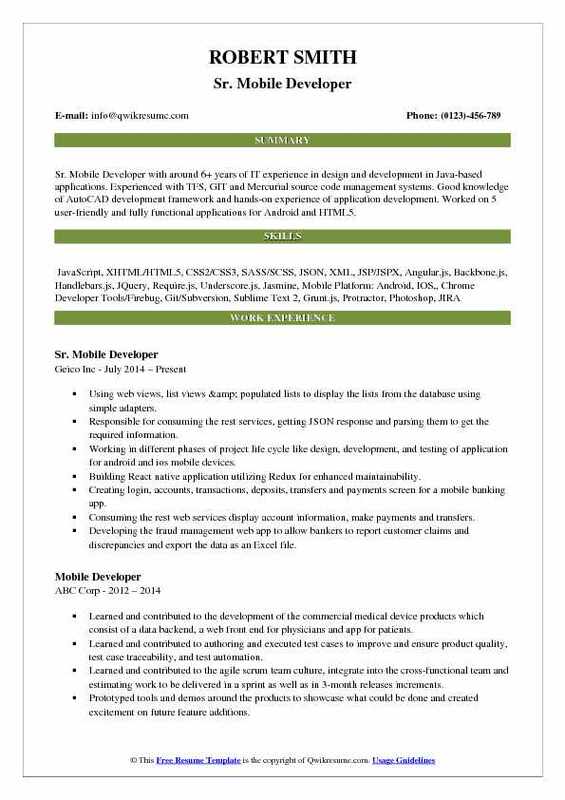 Aspirants interested in this line of operation have to specify in the Mobile Developer Resume the much-needed qualifications such as – mobile application expertise, programming language skills in C#, Java, Objective C and a demonstrable portfolio of any released apps on App Store or Android market. For filling this job role, employers normally select the candidates holding a Degree in Information Technology or the related. Some employers, however, oversee work experience over formal education. Skills : Mobile Platforms Xamarin, IOS, Android, Windows 8 RT, Tizen Java MVC Frameworks Java, Struts, Spring, Hibernate, EJB, Ibatis, JSF. Apple Xcode, OS X/iOS SDK, WebObjects, Final Cut Studio, Logic Studio Microsoft Visio. Android developer responsible for full app life-cycle: concept, design, build, test, deploy and release to the app store. Provided blackberry support to new and current blackberry users by setting up their blackberry, performed enterprise activations, troubleshoot and resolved any trouble tickets that come up in the blackberry queue in the DOIM UNI center help desk database. Written unit test cases across multiple browsers, platforms, and devices, including. Writing the unit test cases across multiple browsers, platforms, and devices, including smartphones and tablet. Using Cisco workplace portal and built custom models and user services using Spring and Hibernate. Involving in implementing the application for mobile devices (iPhone, iPad). Configuration and setup of various MySQL performance monitoring tools like Nagios and MySQL enterprise monitor for monitoring MySQL servers. Configuring Perl scripts for monitoring databases and internal health. 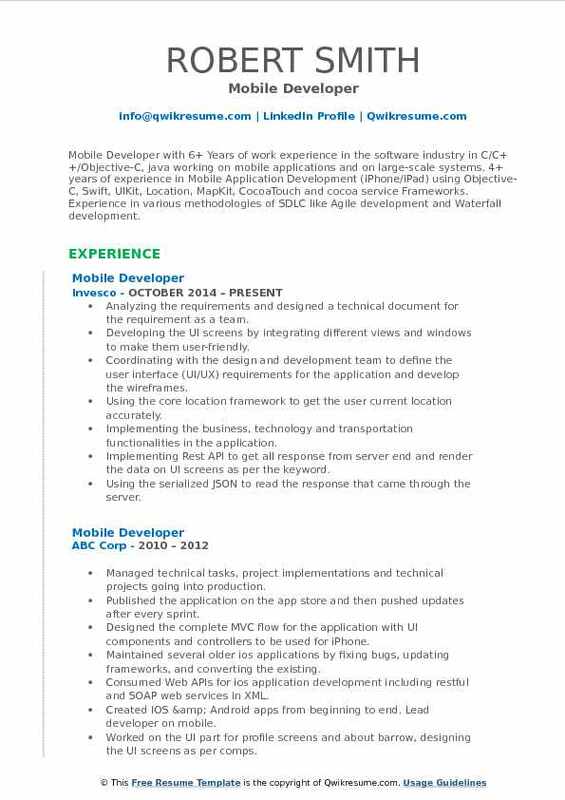 Summary : Senior Mobile Developer with over 8+ years of IT experience in Analysis, Design, and Development of various Mobile Application development for iPhone (Xcode, Objective C, and Cocoa framework) and Android. Extensive iPhone and iPod Touch application development experience. Expertise in iPad application development. 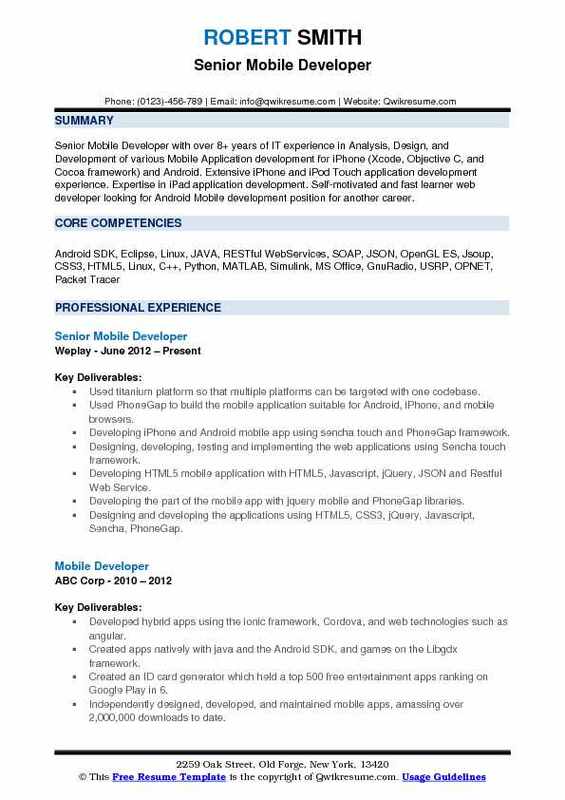 Self-motivated and fast learner web developer looking for Android Mobile development position for another career. Used titanium platform so that multiple platforms can be targeted with one codebase. Used PhoneGap to build the mobile application suitable for Android, iPhone, and mobile browsers. Developing iPhone and Android mobile app using sencha touch and PhoneGap framework. Designing, developing, testing and implementing the web applications using Sencha touch framework. Developing the part of the mobile app with jquery mobile and PhoneGap libraries. Using Adobe Photoshop and Coreldraw to computerized drawing for client firms. Working on full software development cycle from concept through deployment for IOS and Android. Designed and wrote the unit test cases and scenarios for windows phone 7. Headline : Sr. 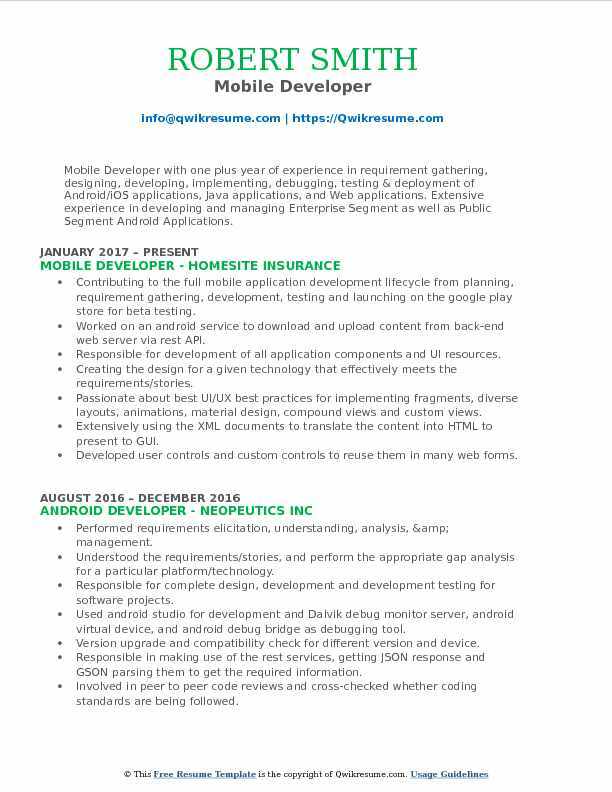 Mobile Developer with around 6+ years of IT experience in design and development in Java-based applications. Experienced with TFS, GIT and Mercurial source code management systems. Good knowledge of AutoCAD development framework and hands-on experience of application development. Worked on 5 user-friendly and fully functional applications for Android and HTML5. Using web views, list views & populated lists to display the lists from the database using simple adapters. Working in different phases of project life cycle like design, development, and testing of application for android and ios mobile devices. Building React native application utilizing Redux for enhanced maintainability. Creating login, accounts, transactions, deposits, transfers and payments screen for a mobile banking app. Consuming the rest web services display account information, make payments and transfers. Developing the fraud management web app to allow bankers to report customer claims and discrepancies and export the data as an Excel file. Creating ASP.Net MVC web app to maintain error, application, and audit logs. Developed a mobile app for the company's primary service for visualizing data and reading industry news. 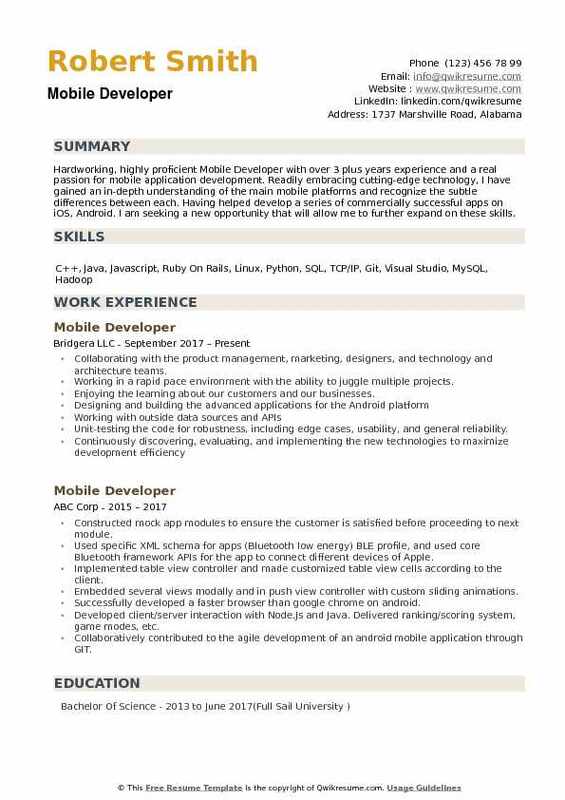 Headline : Mobile Developer with 6+ Years of work experience in the software industry in C/C++/Objective-C, java working on mobile applications and on large-scale systems. 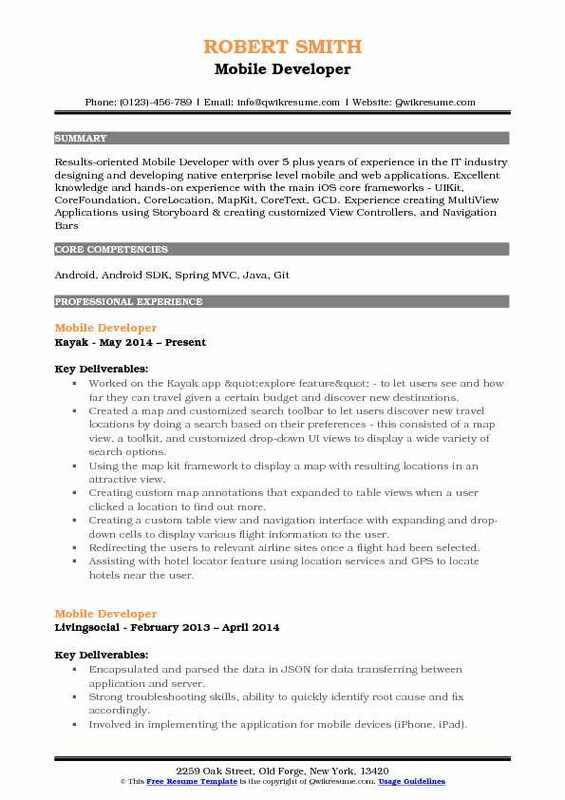 4+ years of experience in Mobile Application Development (iPhone/iPad) using Objective-C, Swift, UIKit, Location, MapKit, CocoaTouch and cocoa service Frameworks. Experience in various methodologies of SDLC like Agile development and Waterfall development. Skills : IOS Objective-C And Cocoa Development For iPhone And IPad Devices In Xcode 4.6 Interface Builder-UIKit, Cocoa Touch, Core Data Software IOS Xcode OSX 10.6, 10.9, ASP.Net With Visual Studio. Analyzing the requirements and designed a technical document for the requirement as a team. Developing the UI screens by integrating different views and windows to make them user-friendly. Coordinating with the design and development team to define the user interface (UI/UX) requirements for the application and develop the wireframes. Using the core location framework to get the user current location accurately. Implementing the business, technology and transportation functionalities in the application. Implementing Rest API to get all response from server end and render the data on UI screens as per the keyword. Using the serialized JSON to read the response that came through the server. Testing the application with various templates to release the app for different scenarios, utilizing the same code base. Working closely with the web application development team to ensure proper integration between mobile application and web application. Objective : Mobile Developer with 4 years of Mobile Development experience that includes application development, customization and up gradation support. Experience in developing e-commerce mobile applications that provide enhanced online shopping experience. Developed multiple Android applications across versions. Experience in creating handset specific user interface (UI) and implementation of fragments for mobile phones and tablets. Worked on development of e-commerce, mobile applications that provide a superior online shopping experience for the users, where the users can browse through the products, search for products and make a purchase easily through credit card payments using this app. Involved in UI discussions to enhance the look and feel of the application. Implementing the features such as saving addresses for future use, ship-to-store functionality that locates stores based on user input, making payment with gift cards or credit/debit cards. Involved in development of features such as adding and deleting items to and from the shopping cart or wishlist, sharing product details via email. Developed the customized dialogs that display a list of special order items for approval or removal before the user makes a purchase. Experience with handling UI updates with multi-threading technologies such as Asynctask or handler. Involved in discussion with server team and IOS teams, and making sure we get data in the right format for processing and presenting it to the user. Involved in parsing the JSON data received from the server and presented in a user-friendly manner. 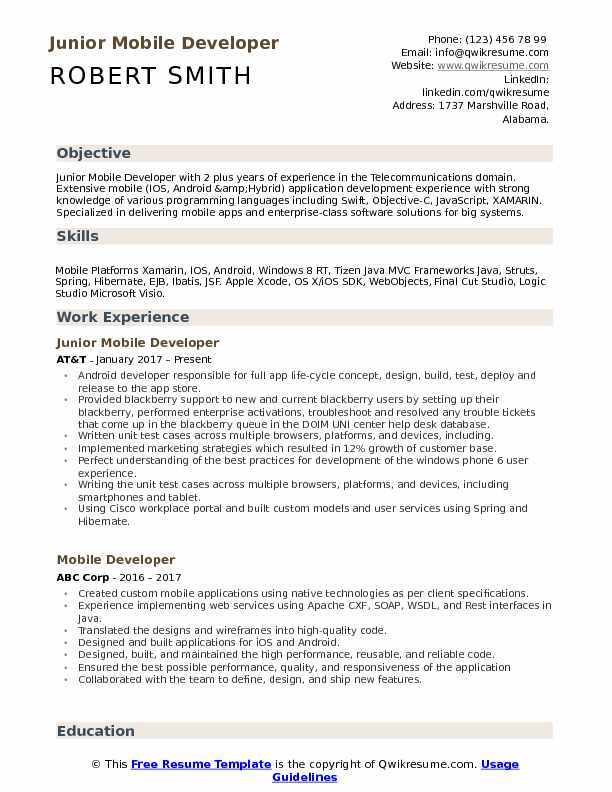 Objective : Junior Mobile Developer with 4 years of experience is seeking to obtain a software engineering summer internship position where I can utilize the skills and contribute to the success of your company. Responsible for bandwidth, memory, and performance optimization to reduce total data costs. Contributed to the cross-platform mobile applications. Integrated with the back-end services to make sure we are delivering a great mobile user experience that is super-fast for end users. Helped improve code quality through writing unit tests, automation and performing code reviews. Participated in brainstorming sessions and had the chance to contribute innovative and original ideas to the technology, algorithms, and product in a highly collaborative, team-oriented environment. Involved in maintenance, bug fixes and minor enhancements of the apps. Worked extensively with core data, foundation, core animation, cocoa touch, and UI Kit. Objective : Mobile Developer with one plus year of experience in requirement gathering, designing, developing, implementing, debugging, testing & deployment of Android/iOS applications, Java applications, and Web applications. Extensive experience in developing and managing Enterprise Segment as well as Public Segment Android Applications. Contributing to the full mobile application development lifecycle from planning, requirement gathering, development, testing and launching on the google play store for beta testing. Worked on an android service to download and upload content from back-end web server via rest API. Responsible for development of all application components and UI resources. Creating the design for a given technology that effectively meets the requirements/stories. Passionate about best UI/UX best practices for implementing fragments, diverse layouts, animations, material design, compound views and custom views. Extensively using the XML documents to translate the content into HTML to present to GUI. Developed user controls and custom controls to reuse them in many web forms. Worked on the Kayak app "explore feature" - to let users see and how far they can travel given a certain budget and discover new destinations. Created a map and customized search toolbar to let users discover new travel locations by doing a search based on their preferences - this consisted of a map view, a toolkit, and customized drop-down UI views to display a wide variety of search options. Using the map kit framework to display a map with resulting locations in an attractive view. Creating custom map annotations that expanded to table views when a user clicked a location to find out more. Creating a custom table view and navigation interface with expanding and drop-down cells to display various flight information to the user. Redirecting the users to relevant airline sites once a flight had been selected. Assisting with hotel locator feature using location services and GPS to locate hotels near the user. Working on improving UI features - fixed many date formatting issues in different locales, fixed currency converter and added numeric keypad, added language support. Summary : Skilled iOS Developer with 9 plus years of experience in pushing the boundaries of the iOS application platform where design, beauty, and functionality are equally important. 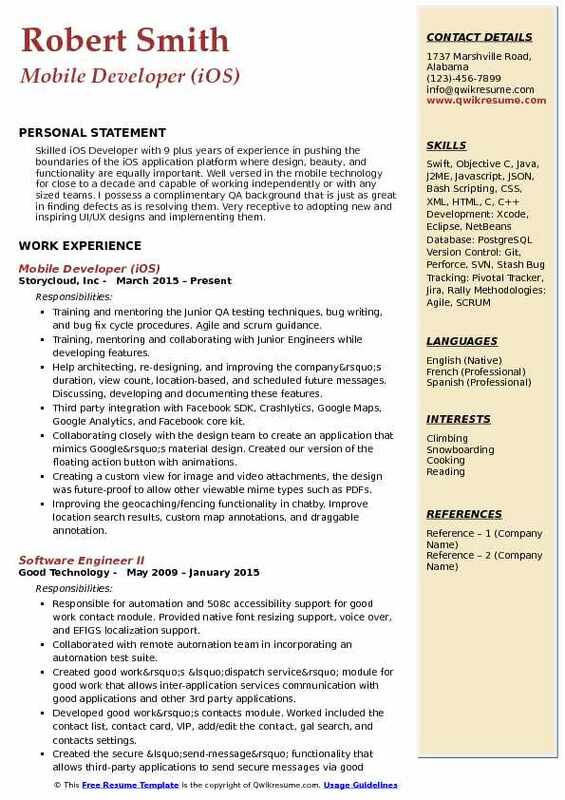 Well versed in the mobile technology for close to a decade and capable of working independently or with any sized teams. I possess a complimentary QA background that is just as great in finding defects as is resolving them. Very receptive to adopting new and inspiring UI/UX designs and implementing them. Training and mentoring the Junior QA testing techniques, bug writing, and bug fix cycle procedures. Agile and scrum guidance. Training, mentoring and collaborating with Junior Engineers while developing features. Help architecting, re-designing, and improving the company’s duration, view count, location-based, and scheduled future messages. Discussing, developing and documenting these features. Third party integration with Facebook SDK, Crashlytics, Google Maps, Google Analytics, and Facebook core kit. Collaborating closely with the design team to create an application that mimics Google’s material design. Created our version of the floating action button with animations. Creating a custom view for image and video attachments, the design was future-proof to allow other viewable mime types such as PDFs. Improving the geocaching/fencing functionality in chatby. Improve location search results, custom map annotations, and draggable annotation. Developing custom UI for the chat by such as custom navigation bar, reusable progress bar, airplane and no network info bar, custom pop-ups. Developing the custom camera screen for chat application based on the UI/UX specs. 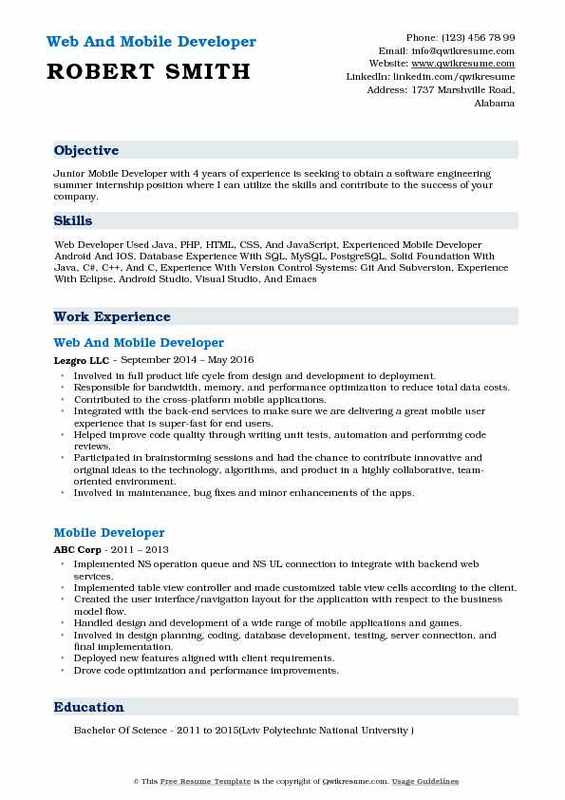 Objective : Hardworking, highly proficient Mobile Developer with over 3 plus years experience and a real passion for mobile application development. Readily embracing cutting-edge technology, I have gained an in-depth understanding of the main mobile platforms and recognize the subtle differences between each. Having helped develop a series of commercially successful apps on iOS, Android. I am seeking a new opportunity that will allow me to further expand on these skills. Collaborating with the product management, marketing, designers, and technology and architecture teams. Working in a rapid pace environment with the ability to juggle multiple projects. Enjoying the learning about our customers and our businesses. Unit-testing the code for robustness, including edge cases, usability, and general reliability. Extensive knowledge of size-classes, auto-layout, and configuring view constraints to create beautiful and scalable user interfaces across all ios form factors. Connecting with business entrepreneurs to create mock-up app functionality, buttons, styles, layouts, and basic mobile app layout.